We always love the tasty foods. If the tasty food is prepared in a healthy way it attracts everyone. Today i am going to present you a healthy and really tasty chutney. This chutney can be prepared instantly or can be prepared a day before too. You can store this chutney for a day or two in refrigerator and heat it like curries and have it. I have tried in this way the taste does not changed. 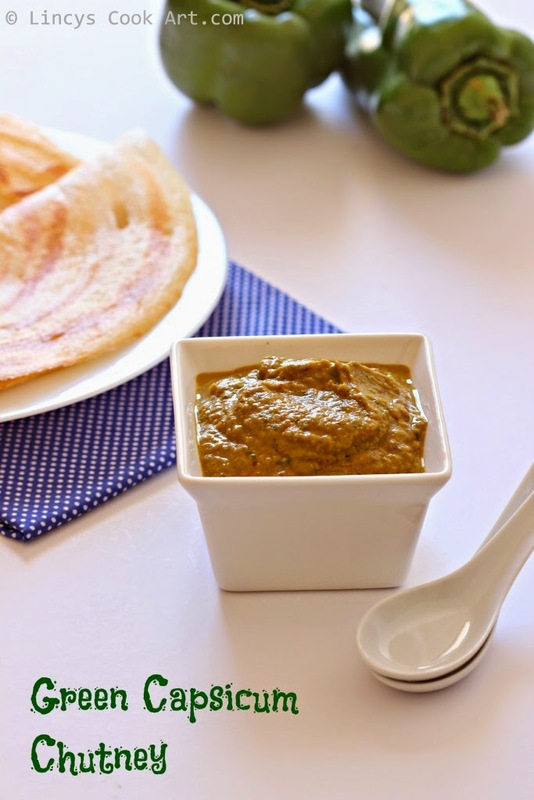 This Chutney can be prepared easily as a tasty accompaniment for Idlis and Dosas. So flavourful chutney prepared easily with the ingredients already available in our pantry. Perfect easy to prepare side dish breakfast or dinner. Heat a teaspoon of oil in a pan and roast the jeera, urad dhal, dried red chillies and tamarind together till the urad dhal becomes golden colour and the red chillies becomes crisp. Set aside and allow to cool. Heat two teaspoons of oil in a pan and add the cubed onion, pinch of salt and cook slightly. Then add the garlic and cook for a minute then add the tomato and cook for a two minutes till it becomes slightly soft. Now add the capsicum and enough salt. Cook for two minutes till the peel starts to get blisters or the bright green colour starts to change. Now add the urad dhal mixture into the blender and powder it. If it is a corse powder also it will grind further with capsicum. Love this flavorful and delicious chutney!